Ever since my 6-year-old self was completely wowed by Star Wars Episode IV: A New Hope way back in late 1977, I have loved movies and going to the cinema. For me, one of life’s simplest yet greatest pleasures is seeing a good film with an appreciative audience who applaud, cry, groan and laugh together as one. It’s a terrific buzz. So far this year, the best time I’ve had at the movies was seeing Jaws at a local independent cinema that was showing this 1975 classic to celebrate the 35th anniversary of its release. I have seen Jaws several times before, and I own a copy on DVD – but I had never watched it on the big screen. As well, the audiences at that particular cinema are usually very good – they go there to actually watch films, not selfishly get on other viewers’ nerves – so this was too good an opportunity to pass up. And I’m very glad I went, because my expectations were exceeded. Firstly, the audience was just as I’d hoped and I joined right in. All throughout Jaws there were laughs, gasps, screams and – especially during Quint’s famous monologue about the USS Indianapolis disaster – stunned silence. And, yes, at the end there was rapturous applause. Secondly, I hadn’t seen Jaws for some time, so I was interested to see how it held up and what my current self would make of it – and very much like that 6-year-old watching the original and best Star Wars movie for the first time, I was completely wowed. 35 years later, Jaws is still an amazing piece of cinema in so many ways. On the surface (pun unintended), it’s still an exciting, gripping and unnerving story about a giant monster on the loose, directed by a young and ambitious Steven Spielberg who was getting better with each film he made. As well as those thrills, though, there are the added elements that help make Jaws seem so convincing. Firstly, not only had I forgotten how good Spielberg can be as an action director, but I also rediscovered one of his other great talents – depicting the chaos of ordinary life. 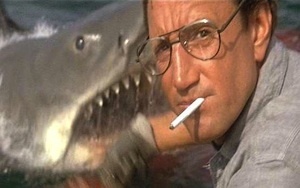 His Amity is an everyday noisy madhouse of people doing too many things at once and frantically talking and yelling over each other – so much so that when Chief Brody, Hooper and Quint first set off in the Orca, it’s a relief to finally get some peace and quiet for a while. Secondly, like other great movies of its time, Jaws has that wonderfully natural mid-1970s look and feel. There is no glamour, the clothes and hairstyles are dreadful, and by today’s standards almost everyone looks painfully skinny – things really were different back then. Finally, and perhaps most importantly, there’s the cast. With one exception who deserves a paragraph of his own, most of the folks in Jaws are just like us – ordinary-looking, ordinary-behaving, and easily getting cranky and excited and scared (and sometimes all at once). That’s why the shark-attack scenes with crowds are so chillingly effective; why smaller scenes like Murray Hamilton’s stunned mayor finally giving approval to bring in a shark-hunter are so moving; and why the late great Roy Scheider is fondly remembered as Chief Brody – he was very much a regular guy suddenly thrown into a unbelievable situation, but despite having the most unfortunate phobia in that instance (fear of water!) and coming face-to-face with great horror, he kept on fighting right up until the end. In the paragraph of his own is Robert Shaw who steals the second half of Jaws as the unforgettable Quint. Like the shark, Quint is larger than life, fearless and terrifying – most of the time, he makes you laugh yet cringe at the same time. And when he’s not stomping about leaving fear and terror in his wake, there are the quietly powerful moments like his USS Indianapolis monologue. If you haven’t seen Jaws for a while or at all, and especially if you get the chance to see it on the big screen, I highly recommend it. 35 years later, it’s still a classic and will always remain one. This entry was posted in Gratitude, Happiness, Life is Good. Bookmark the permalink.